A few notes: King size, 104" x 96", flea market fancy plus some others in the blocks, moda crossweave in gray for sashing and borders. 96" borders take a LONG time to make and attach. For the Naked Bed Challenge! Some fabrics I used just about all the way up, besides my FMF, that I might try to replace: turquoise henna garden, pink grunge, that one pointy diamond fabric by H. Bailey in light blue, the turquoise scissors fabric. This was my main project for just about 3 weeks and it was almost the only thing I sewed during that time. It was less stressful than my typical sewing MO which is a sort of project ADD, working a little bit on something and then switching to something else when I feel like it. All the while having several projects occupying my brain space and stressing me out. Working on one thing was so different (in a good way) for my stress levels--I'm going to try it more often! Looks great, Vicki! I had just become interested in quilting when FMF was released. By the time I was aware of its awesomeness, everything was gone... Lucky that you have a stash of it for projects like this! I really like it! It looks so much different than I was expecting, with that blue/grey. But it's wonderful! It turned out beautiful Vickie! Congratulations on a great finish! I love the crossweave for the sashing and border. It really adds depth/texture. love your colors! great finish on that top - borders are my least favorite thing, not sure I would make it all the way across one 96" ! 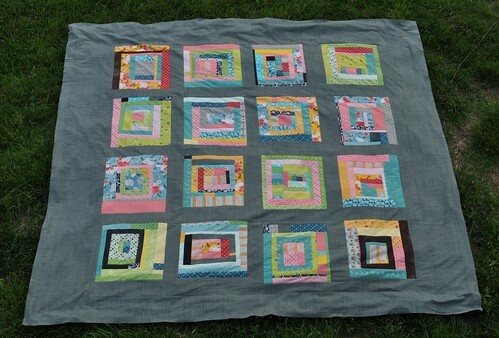 I love how the gray sashing manages to be restful and be a fabulous complement to the blocks. Beautiful! Amazing!!! A king size bed quilt is an accomplishment. Looks great! Great pattern. The squares remind me of the Log Cabin. I love the mix of colorful fabrics too. Hey lovely blog and nicely wrote. Thanks for sharing this useful stuff with us. I am looking up for king size quilts for my home and also want to share related information with you. Please take a look. Hope you like it. Ruffle Crush--My First Quilt Pattern!